The average person living in Manhattan rentals might not immediately think of New York City as the home of great Oktoberfest celebrations, but they would be sadly mistaken. You see, the city that never sleeps is a diverse melting pot. People from every culture from around the world either live or work in the five boroughs, so it only makes sense that incredible Oktoberfest celebrations can be found all over the city. What do you plan on doing this Oktoberfest? Are you going to vegetate in front of your TV during the more than 4 week-long festival? Or are you going to get off of your couch and go out and celebrate? If you plan on doing the latter, we highly recommend checking out any one of the four top Oktoberfest celebrations we’re about to recommend below. So, if you love good food, even better beer, German culture, and plenty of great people to celebrate with you, we highly recommend participating in Oktoberfest this year. In many areas, the festivities have already begun, the celebration doesn’t seem to ever want to come to an end, and it’s truly a unique and wonderful opportunity that you shouldn’t have to pass up again. Watermark Bar, located at 78 South St., Pier 15, Manhattan, it has one of the most amazing Oktoberfest celebrations you’ll ever see. They dedicate four weekends to the celebration every year, and this year is no different. The festivities begin on September 15 and end on the weekend of October 14. The party starts at 12 PM in the afternoon and doesn’t end for another 12 hours at 12 AM in the morning. It’s truly a celebration that everyone can appreciate, whether you’re of German descent or not. So do yourself a big favor and head over to Watermark Bar this weekend or next weekend to find out what all of the enthusiasm is about. The food is outstanding and the German beers are second to none. The majority of the food items being sold at Watermark Bar will cost around $10. The same holds true for single beers. If you prefer to drink from one liter Steins, it takes two regular beers to fill up the Stein, and it only costs $15 to purchase, which definitely makes it the more economical way to get drunk during the festivities. So do yourself a favor and head over to Pier 15 at 78 South St. in Manhattan this weekend, next weekend, or the weekend ending on October 14. You really don’t want to miss the excitement, the authentic German festivities, the authentic food and beer, and so much wonderful camaraderie and companionship. Many people in New York call Bierhaus NYC the Oktoberfest capitol of the Big Apple. The bar and restaurant calls itself Oktoberfest headquarters and for very good reason. Beginning on September 16, the Oktoberfest celebrations will last for more than four weeks when they finally come to a sloppy drunken close on October 21! Why do they think they have a stranglehold on all things Oktoberfest in NYC? Well, the bar is directly affiliated with Hofbrauhaus, the award winning beer maker located in Munich, Germany. This bar is great because it’s very close to Grand Central Terminal, so you will not have to walk far in order to catch the train. They have a pretzel dip bar, a pig roast, keg tapping, and you may even find yourself getting a free round of beer or two on the house. It’s even going to be a fun festivity for the kids. The weekend celebrations have Kidtoberfest, which is a lot of fun for kids 10 years of age and younger because they have live music, free food, coloring, and face painting. You should definitely check it out and on the weekend you can even bring your family along. For the fourth year in a row, Munich on the East River is hosting their incredible Oktoberfest celebration. The fun begins on Friday, September 28, 2018 at 5 PM. And the festivities finally come to a close on Sunday, October 7, 2018 at 8 PM. What makes this Oktoberfest celebration so special? According to many aficionados, this celebration is known for its authenticity. In fact, many people believe that as far as Oktoberfest celebrations are concerned, this is the most authentic that NYC has to offer. They say it even compares to many of the Oktoberfest celebrations going on in Germany at the time, which really is a high honor for this organization. Munich on the East River is located at 24 – 20 FDR Drive Service Road East in Gramercy Park in Manhattan. You’ll know it when you see it because the festivities are really hard to miss. 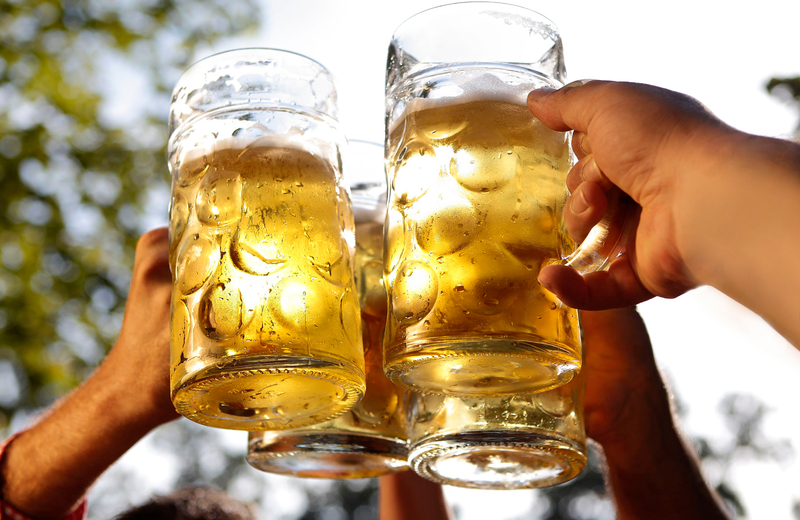 Bring your friends and family along and enjoy great tasting German beer, delicious German food, and do so at a very affordable price of $28 for general seating and $38 for reserved seating. Each year, Radegast Hall celebrates Oktoberfest in style and they really go all out to make sure everyone has an amazing time at this exciting celebration. Located at 113 N. 3rd St. in Williamsburg Brooklyn, the fun festivities begin on September 16 this year and the celebration keeps going all away until the end of October. So you’ll have plenty of time to take in German culture and experience Oktoberfest like you’ve never experienced it before if you stop by this exhilarating biergarten celebration. Every Saturday, the doors to the celebration open at 11 AM and they begin with a ceremonial keg tapping and pig roast. There will be live music, great food, mug holding competitions, DJs spinning music late into the night, and everyone is ultimately going to have a fantastic time.